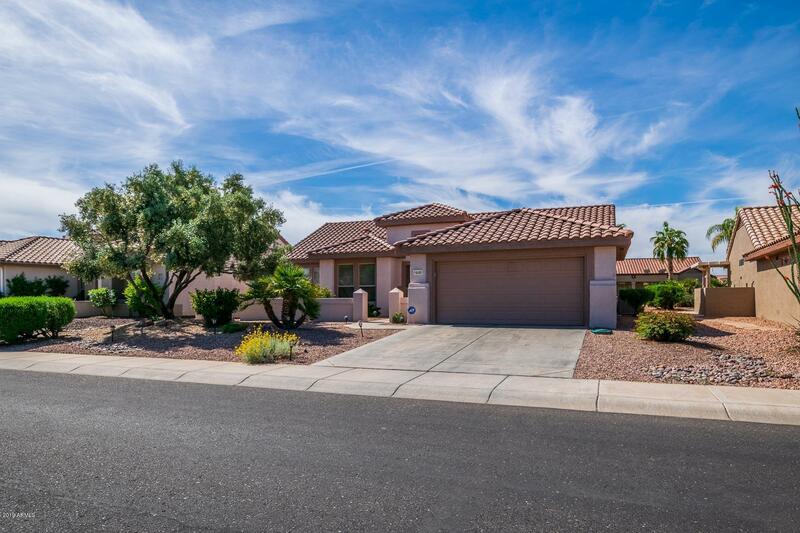 All SUN CITY GRAND-MOUNTAIN V homes currently listed for sale in Surprise as of 04/20/2019 are shown below. You can change the search criteria at any time by pressing the 'Change Search' button below. "This amazing 3 bd., 2 bth. Extended STONECREST model will wow you when you enter. Approximately $65K in upgrades, remodel, etc. Fully remodeled kitchen and master bath - 2013, extended bay window in master - overlooking beautiful private patio and yard, Plantation Shutters, extended FR and 3rd bedroom, sun screens throughout, energy efficient water heater and air conditioner, designer flooring - engineered wood and tile, golf cart bump out in garage, garage cabinets and work bench, built-in BB"
"Beautifully updated Stonecrest on desirable cul-de-sac. Inviting entry into lovely interior. 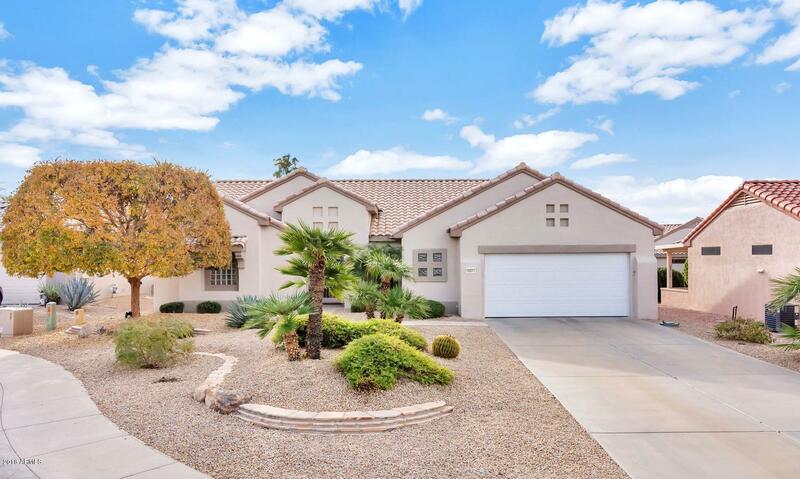 Living, dining & family rooms segue into each other.Enjoy south facing patio, center stage in rear grounds with emerald ''green belt'' viewed immediately walking into house. New plank tile throughout with 4'' baseboards, updated master bath with custom tile, shower & new vanity. LED can lights throughout. 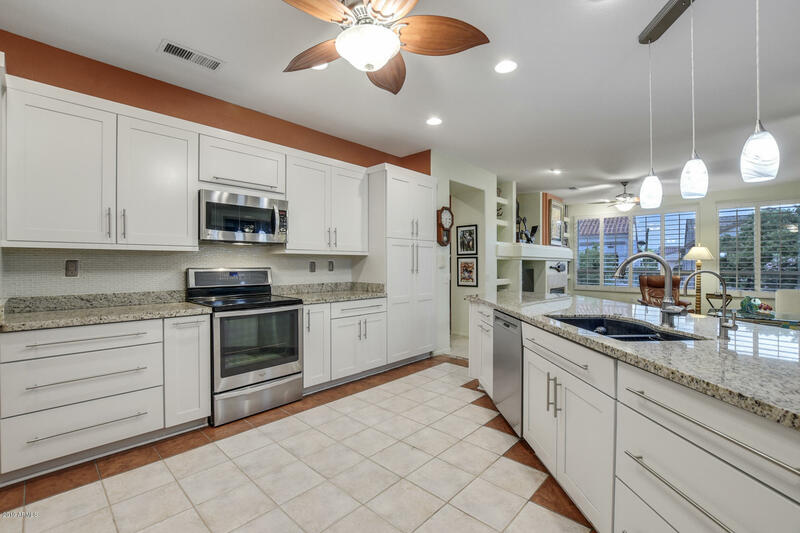 Chef's island kitchen with new slide-out kitchen shelves, updated stove with double ovens & new 3 d"
"Palo Verde is the most popular model in Sun City Grand is located on a quiet street across from golf course properties! It boasts split bedrooms, raised panel doors throughout, Kitchen is a chef's dream with openness to guests & TV or the beautiful view of the back of the property. Master bedroom has a bay window, walk in closet, & dual sinks in master bath. Vacation Mailbox, PVC Irrigation System and roomy patios in the front & rear of home. DON'T MISS THIS GREAT PROPERTY! COME & MAKE IT YOUR"